It’s been a month of strange timing and judgements calls. The balmy days of late February were followed by the tail end of a storm, whipping through the treetops and rippling the tunnel roofs. Capricious spring weather. Tulip ‘Concerto’ flowering in one of the tunnels, and dahlia tubers going into their pots. In the outside beds the hellebores are still flowering happily along with scilla, snowdrops and the beautiful wood anemone nemerosa, an incredibly delicate and soft variety. 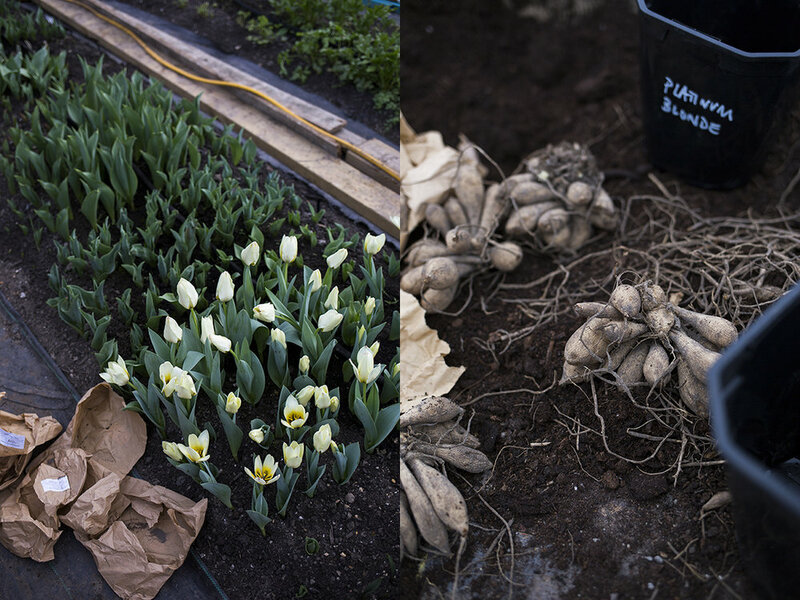 To hedge our bets (last year having had late snow) in the autumn we split our bulbs, planting half in the tunnels and half outside, including replanting many of last year’s tulips and narcissus bulbs (which we stored over winter in the shed) in the smaller tunnel for an early crop. As luck would have it, encouraged by the warmer weather many of these are already flowering and we will no doubt be missing a number of our early flowering varieties while we are overseas - such is the heartbreak of leaving a garden you so lovingly tend! 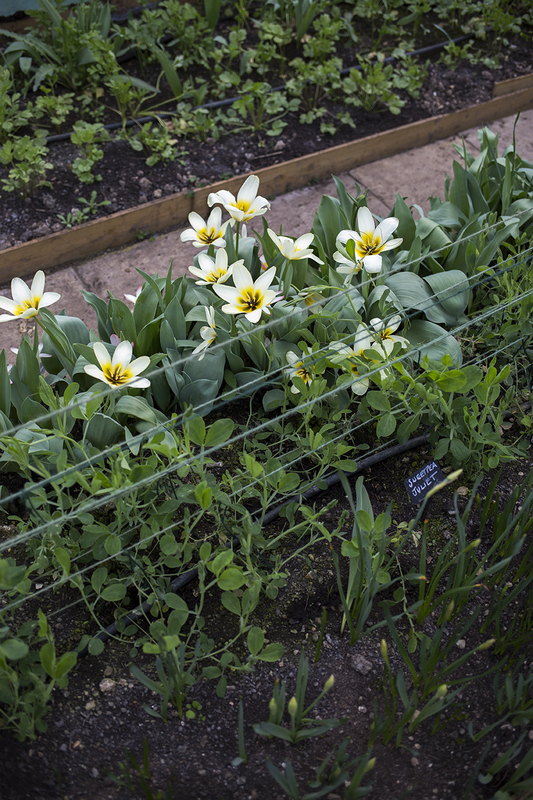 So far we’ve cut ‘Concerto’ - a creamy yellow tulip with a black centre like a bumblebee’s bottom, narcissus ‘Actea’, ‘Elka’, ‘Cheerfulness’ and ‘Jenny’ and pleasingly long-stemmed anemones, along with masses of heavily scented apricot, pink and white hyacinths. 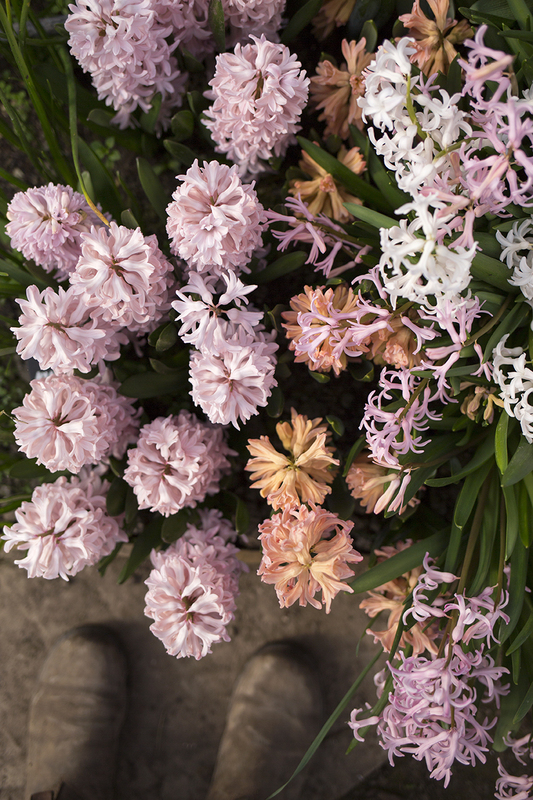 We trialled ‘Multiflora White Pearl’, ‘Gypsy Queen’, ‘Aiolos’, ‘Pink Festival’ and ‘White Festival’ hyacinths this year; after a disconcertingly quiet winter they suddenly popped up in the new year and grew very happily in the tunnel. A final push last week saw the final (for now at least) section of the cutting garden transformed from an ill-planned and weedy area to four new long beds. Into one of these have already been planted new shrubs including Nandina, Pittosporum and Spiraea and the others will be filled with a mass of colourful dahlias come early summer. Seeds sown this month - Nicotiana, including our favourite ‘Apple Blossom’ from last year and a new variety we’re excited about called ‘Tinker Bell’. Also tomatoes, stocks - lots of whites, apricots and pale pinks - and Malope. We’re looking forward to welcoming Becky to the team in May who has spent the last few years as a chef on sailing yachts (so a seasoned early riser and used to being out in the weather!) She will be working on regular maintenance and helping to cut flowers ahead of our weddings and workshops. The garden, which has gradually grown from an allotment-sized plot (and before that a large bramble patch) to just over a quarter of an acre, is intensively planted and we are hoping it will be an extremely productive operation this season. While we’ll still be very involved we’re excited to see what a difference an extra pair of hands makes - to the garden and to us! This month we’ve been preparing the studio ahead of another busy year. The ‘season’, by which I mean the hustle that begins in April and goes on until late October, kicks off again as soon as we get back from the Far East so we’ve been working day and night to make everything ready. Finishing the studio garden, painting and polishing, restocking sundries and props. It’s going to feel so good to open our doors again and we can’t wait to welcome all our visitors this year. Pops of colour for a spring drinks party in Soho; one and a half metres of tulips, Cornish narcissi,and alliums, with butterfly ranunculus and Fritillaria Uva Vulpis & Meleagris dancing above. We’re also soon to be joined by Yukiko, a florist from Japan, who is coming on board our team and will be working with us in the studio from next month as well as some talented new freelancers assisting on our events and a few lovely volunteers lending a hand in exchange for learning the ropes and having some creative time with the flowers. The studio will be a productive and industrious place this season! Looking forward to long, light days fuelled by iced coffee and good music and flowers everywhere you turn - the best kind of days. Magnolia in bloom at Kew Gardens. On the right: Magnolia heptapeta ‘Yulan’. It has been a knock-out year for the London magnolias. We were lucky enough to catch them fully blown at Kew Gardens recently, some blooms the size of large dinner plates and almost frighteningly perfect - like leaves of velvet, streaky pink or as white as snow. Many had been battered by the buffeting winds, the grass strewn with a carpet of jettisoned petals. Light spring arrangements to dress an apartment in Kensington for an interiors shoot earlier in the month designed by Olivia Outred. Featuring tulip ‘Verona’, velvety brown Iris tuberosa (widow iris) from Cornwall and Primula ‘gold lace’. With the warmer weather and weeds beginning to encroach again down at the garden we’ve been experimenting with using foraged stems in bouquets and arrangements. Rosettes of Cardamine hirsuta (hairy bittercress, which is edible as a bitter herb and apparently very good in small doses in salads) or Prunella vulgaris (self heal) look beautiful in low bowls as an alternative to moss and Sinapis arvensis (charlock) as fillers for hand-tieds. We’re so drawn to the ‘waste-not-want-not’ approach and ridding ourselves of a hierarchical attitude when it comes to the materials we use. At our core we are celebrating the fleeting beauty of nature and one of our founding principles at Aesme was (excuse the pun) ‘digging deeper’. This is why we established our cutting garden in the first place, because we want a direct relationship with our produce that goes beyond just buying and selling. The ingredients we use tells the story of the season, the weather, they are deeply evocative and we are nurturing them or finding them and using them carefully and with consideration for the other elements they are put with. Like a chef taste-testing recipes - it’s all about the combination of one ingredient with another, the preparation and then the execution. Sometimes it works, and sometimes it doesn’t. Adding in extra colour or texture is like adding seasoning - the bright, sour flowers of the charlock in the bouquet above and below are like a hit of citrus in a creamy dessert when added sparingly to the paler tulips, but they would be too much with other more dominating colours. Weeds are too often overlooked and an untapped resource for new and interesting ingredients. We’re going to be researching them, harvesting them and arranging with them a lot more this year. Left: a small bowl arrangement of yellowing anemone leaves, rosettes of hairy bittercress and Narcissus ‘Elka’. Right: a bouquet of tulips, Narcissus ‘Wedding Bell’, Anemone ‘Coronaria The Bride’ and charlock. Some of you may have seen on ‘Instagram Stories’ that Jess and I are currently in Japan. I am writing this update from Kyoto where it is 6.00am. We have been longing to visit Japan for many, many years so it is a dream come true to finally be here, to see some of the most beautiful gardens in the world, and draw inspiration from Japanese design and aesthetics at the source - the attention paid to every minute detail here is astounding and touching in equal measure. 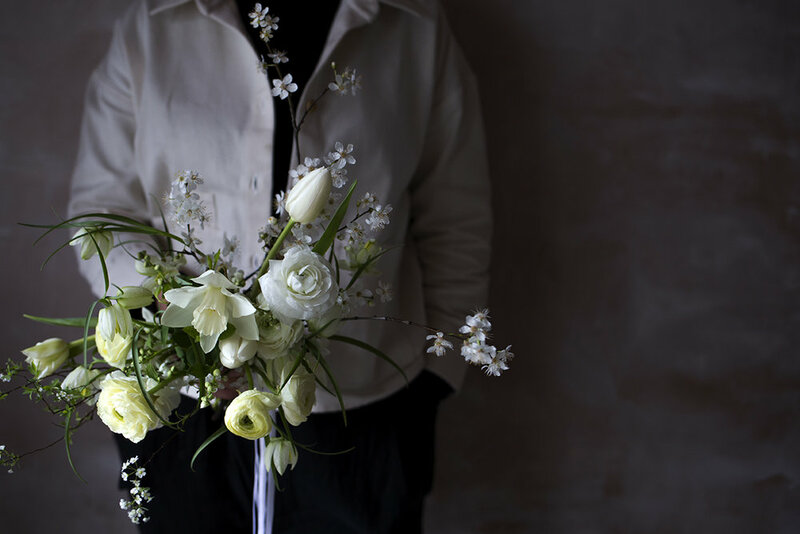 We already feel an affinity to certain aspects of the Japanese art of flower arrangement, Ikebana - the emphasis on seasonality and the artful treasuring of a restrained selection of ingredients. It will be fascinating to take a class and begin to explore the history of this ancient art form and spiritual practice further. We’re back to Tokyo at the end of the week and from there fly to Seoul to spend a couple of days visiting the flower market and then on to Jeju Island to teach a 3 day workshop. We knew that there would be so much to share from this trip that it would warrant its own blog post so stay tuned for this next month! We are now sending regular newsletters! Sign up with your email address to receive seasonal updates from the studio and be the first to hear about upcoming classes, pop-ups and retreats.